A Sparkle Party is an entertainment provider for children’s birthday parties and similar events. They are based in Sutton in the UK and they serve the greater Surrey area. 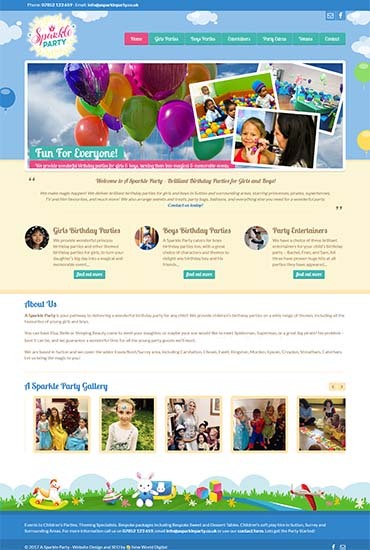 A Sparkle Party deliver colourful fun-filled parties, tailor-made for each child, but an existing website did not properly portray that. Instead, it suffered from poor design, and generally looked stale. Its other major issue was that it did not rank highly for any key search terms. They asked us to help. We performed our customary market research to analyse the size of the potential market. In consultation with the client, and bearing in mind the current size of the operation, we determined to concentrate mainly on the Sutton area for SEO purposes, rather than broadening it to all of Surrey or Greater London. We then re-wrote all content on the older site according to best SEO practice, while still making it attractive to parents and children alike. The client approved the new content, and we then moved on to the build itself. Visual aesthetics are particularly important in any website with children in mind, so we paid great attention to making the site look as attractive as possible. We supplemented photos from the client with stock photos of favourite children’s TV, film, and storybook characters for A Sparkle Party. We also sourced other imagery to add to the overall look. Then we built the site so that it easy to navigate. We give all info needed on any particular party option on that particular page, to save the user from having to browse between pages to get all the detail they require. And as with all our website designs, it is fully responsive for smaller screens such as phones and tablets. We also carried out extensive SEO work on each page and image. The result was that immediately after re-launch, www.asparkleparty.co.uk ranked in the top 5 of www.google.co.uk for search terms including ‘children’s parties Sutton’, ‘birthday parties Sutton’, and ‘princess parties Sutton’. Our client was delighted with the new site, and customers have given positive feedback to the site too.